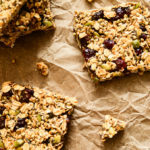 To make these pumpkin and cranberry granola bars, you'll add oats, buckwheat groats, dried cranberries, raisins, pepitas, chia seeds, hemp seeds, and pumpkin pie spice to a large mixing bowl. Then, you'll whisk together almond butter, brown rice syrup, pumpkin purée, pure maple syrup, and vanilla extract over the stove, and pour that sweet, buttery deliciousness over the dry ingredients. After a few easy, breezy stirs, you'll turn the mixture out onto a pan and press it into one large granola bar. The bar sets in the freezer for a bit, and then you'll slice it into squares or rectangles—your choice—before enjoying. Add the rolled oats, buckwheat groats, cranberries, raisins, pepitas, chia seeds, hemp seeds, and pumpkin pie spice to a large mixing bowl. Add the almond butter, brown rice syrup, pumpkin puree, maple syrup, and vanilla extract to a medium sauce pan. Heat over low and whisk together until all ingredients are incorporated (about 3-5 minutes). Pour the almond butter mixture over the dry ingredients and gently stir together. Turn out the mixture onto the baking sheet and use a spatula or your hands to spread the mixture out evenly into a 1/2-inch thickness. Cover the top of the pressed-out granola mixture with a piece of parchment paper and use a rolling pin to compact the mixture by rolling it back and forth over the parchment paper. Discard the top sheet of parchment paper. Pop the pan in the freezer for 1 1/2 hours to set. Gently lift the granola bar out of the pan and place on a cutting board. Slice the large bar into smaller bars. Transfer the bars to an airtight container and return the container to the freezer for another hour before enjoying. Store the bars in the freezer. These granola bars are best enjoyed straight from the freezer before coming to room temperature.